Crude oil demand is walking a tightrope. Any faulty price signal not based on demand fundamentals will stress already fragile growth in oil’s core products, encouraging consumers to switch to alternatives. That seems inevitable anyway – but a continued producer-led supply crunch could bring it all forward. Carbon’s double-edged nature is starting to make oil look less and less suited to a world with alternative chemistries, priorities and expectations for its long-term sources of energy. The price of oil is calculated – by serious forecasters – to move in the range of $20/bbl to $200/bbl between now and 2020. All very alliterative. What drives this range? As ever, Middle-Eastern geopolitics and the hawkish actions of OPEC are playing their part. Short-term, market money is hugely bullish on oil, confident that OPEC’s new discipline will drive oil prices higher. The markets should take a closer look at oil’s chemistry. For all its spectacle, oil is simply an organic chemical compound, based on the element carbon. And although a drop of oil in a tube looks homogenous and consistent, it is a complex molecular blend ranging from the gas-like, to the almost-coal. At normal temperatures and pressures it is a liquid – convenient, but expensive to store in large amounts, hence our gnawing fears of stock-levels. Exposed to air and elevated heat, oil’s promiscuous carbon molecules readily react, tearing chemical bonds apart to form energy and gaseous byproducts such as carbon, and other, dioxides. More recent chemical techniques allow these carbon molecules to be fused together to form large replicated versions of themselves called polymers – more commonly, plastics. These large chains of synthetic carbon, once formed, are stable and unreactive, hence difficult to decompose. Good news if the product is a sealant, not so good if a single-use shopping bag. Our ingenuity has allowed us to tame oil’s energy and fashion various products from it – but we cannot change its chemical nature, and the laws of chemistry and thermodynamics that follow. This is carbon’s nature, and its two-sided bargain with us: historic energy and modern plastics, chemical consequences with both. More generally, “Fossil fuels” and “hydrocarbons” are human nomenclature to describe the particular form of carbon made when natural carbohydrates, (prehistoric plants and animals), react under high pressure and temperature to create a range of molecules formed mainly from carbon and hydrogen. The organization of these fossil fuels is managed simply by counting the number of carbon atoms. One atom of carbon bound to hydrogen is called methane, a light-weight molecule occurring as natural gas. 10 atoms of carbon (on average) bound to hydrogen but ranging from 2 to about 50 is heavier and more dense, and occurs as liquid oil. 100 atoms plus of carbon bound to hydrogen in various branched and cyclic forms is denser still, and solid in its common form, coal, from which carbon derives its name. It is important to note that fossil fuels lie on this continuous spectrum of carbon – each one of them is a mongrel, a collection of various diverse carbon compounds. Natural gas has some heavier components such as propanes and butanes; oil has light components that replicate these gases; heavier oil molecules look much like coal. These overlapping carbon fractions compete directly to create energy and materials. This chemical arms-race has resulted in the carbon hegemony of the world energy system – about 80-85% of primary energy demand is still provided by fossil fuels, even as global energy use has increased 10 times since 1920. Today, on average, every human being on earth consumes about 2 tonnes of primary energy per year, 1.7 tonnes of which is fossil fuels. On the deficit side of that equation, we each emit about 4.5 tonnes of CO2, and 55% of the energy is lost to the world as unproductive, disordered heat. The burning of carbon remains a primitive and inefficient process at its core. This is the trade-off we made when we committed to carbon. All of this brings us to the production of oil products and consumption today. This is surprisingly tricky to summarise accurately. Here we have used BP Statistical Review of World Energy (2017) and OPEC World Oil Outlook (2017). From these we find that world oil production was 92mboe/d in 2016, whilst oil product consumption was 96.5mboed and crude oil production was 76mboed. First, these venerable industry publications use industry jargon and short-hand when referring to “Oil”. For example BP includes biofuels (ethanol / bio-diesel) in their fossil fuel consumption numbers, but not the production and refining numbers. More importantly, most publications, including BP add “Natural Gas Liquids” to the Oil account – this is a key point as these carbon molecules now account for around 14 million bbl/d of “oil liquids” production, or 15% of total “oil production”. And there are a range of other footnotes to consider such as stock movements and refinery processing gains. These are all relatively small amounts, but they add up. If we correct for the major elements such as subtracting out bio-fuels, and apportioning NGLs to gas sources and crude oil sources, we derive the oil production chart below based on carbon numbers. NB – this is a global average; regional and country profiles may look very different eg if local crudes are very light or heavy. We have also added gas and coal to the picture to reinforce the point that the fossil fuel carbons overlap. This chart emphasises the key issues facing oil markets: the competition between the oil light-ends and natural gas, and the growing dependence on the twin pillars of diesel and gasoline transport fuels. There is also one more issue to consider at the heavy end: a coming switch from heavy fuel oil to low-sulphur gas-oil by 2020 due to marine sulphur regulations. We’ll look at the light-ends and heavy sulphur issues first, and then focus on the central segments of gasoline and diesel. Natural gas is mainly methane (one carbon atom), but it also has a significant proportion (up to 10%) of gases with carbons of 2 – 4 – ethane, propanes and butanes. Refined oil also has a small proportion of these molecules too. They therefore compete directly for their end-uses of heating and raw feedstock for plastics. In addition, oil contains a small proportion of carbon molecules in the 5 – 6 range – variously called naphthas, pentanes plus and natural gasoline. What determines the use of fractions of natural gas or oil as petrochemical feedstock is typically price and logistic simplicity. What has changed significantly over the past 4-5 years is the abundance of natural gas-based NGLs, particularly from US shale production, making them highly competitive. 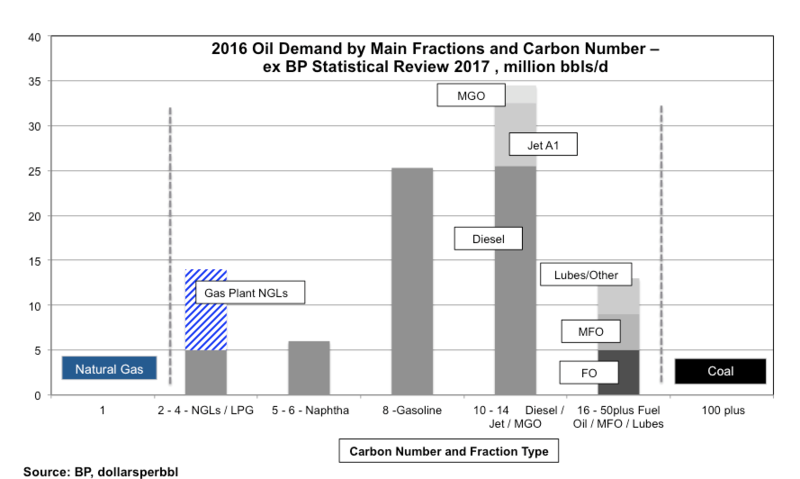 Of the current 14mboed of NGLs, about 65% is derived globally from gas, but this ratio is over 75% and climbing in the US. The US will therefore generate enough new US shale gas NGLs to satisfy its own growing local demand, and export excess to other markets, displacing oil-based equivalents. It’s not as simple of this of course, as Asia tends to use naphthas more than gas NGLs – but the broad trend is that demand growth at the light-end of the hydrocarbon spectrum for petrochemicals will be satisfied mainly by natural gas, not oil. So, on its lighter flank, oil is unlikely to see any near-term demand growth. At the other end of the oil spectrum, some intra-oil competition is about to shift the profile in Chart 1. As noted, hydrocarbons are mainly carbon plus hydrogen – but not totally. Some crude oil varieties have up to 3-5% sulphur secreted in carbon molecules of various sizes. The sulphurous hydro-carbon molecules tend to aggregate at the higher-end as sulphur atoms are about three times as heavy as carbon ones. Over the past few decades, sulphur has been steadily removed from most oil products due to the highly problematic by-product sulphur dioxide. Although formulaically similar to carbon dioxide, suphur dioxide is not the same (a good rule of thumb is to be always careful of assuming similar chemicals react similarly: sodium chloride is table salt, its near-analog potassium chloride is used as the final ingredient of the lethal injection process). Sulphur dioxide is about 100 times more soluble in water than carbon dioxide, forming sulphurous acids in the atmosphere when emitted after combustion. In large enough quantities these emissions produce acidic rain, which over the years has severely impacted a number of global habitats including the US, Canada and Europe. Since the 1980s, a number of international treaties and protocols have been introduced to reduce the impact of acid rain, ranging from technological neutralization through mandates for lower content for fuels. The last place in the oil barrel for this series of international agreements to reach is the heavy fuel oils used for marine shipping. By 2020 the International Maritime Organisation (IMO) has mandated that these heavy ends will also be required to have low-sulphur content, dropping today’s limit of 3.5% to 0.5% in line with other transport fuels. In one sense this is a relatively simple substitution of one end of the oil barrel for another, an intra-oil fix. In another sense this could have major implications – with some analysts suggesting it could destabilize the crude oil supply structure forcing prices sky-high toward $200/bbl. The reason for this is that as fuel oil demand drops by about 2-3mboed around 2020, the demand for low-sulphur diesel will increase by the same amount. In turn this drops demand for high-sulphur (sour) crudes, and increases the demand (and hence price) for “sweeter” low-sulphur crudes. The sweeter crudes tend to be associated with the Brent oil-price benchmark, the more sour ones with the less traded Middle East Dubai benchmarks. Even though total barrel demand remains unchanged, the problems for shippers, refiners and storage locations and so on is likely to cause localized price spikes which could feed in to headline prices. Which reinforces the point that the oil price is an equilibrium of prices amongst the various fractions – if demand in one of them suddenly or steadily increases at the expense of another, the system takes a while to adjust itself, and the dramatic nature of the market takes hold. In 2019-20, even with proper preparations for the change, this shock to the oil equilibrium could send prices sharply north-ward. Good news for oil traders, bad news for consumers. And perhaps quickly bad news for producers again. Many long-term oil demand forecasts, such as those by the IEA, are fond of pointing out how demand gains in various parts of the oil barrel can compensate for losses elsewhere like a cleverly weighted stock portfolio. Chemistry does not work like that. The gaseous competition at the light end of the barrel and the removal of heavier products reinforces the main feature of oil’s future – its growing dependence on just two central fractions: gasoline and diesel. Chart 2 shows the incremental demand increase of all the main fractions listed in Chart 1, 2006 – 2016, ex BP. Since 2006, there has been an absolute and relative shift to dominance of the two road transportation fractions. As the chart shows these two fractions have accounted over 75% of the increase demand in the 2006-16 period. As we’ve seen, this concentration is only going to get stronger, as gas caps any growth in the lighter barrel, and the phase-out of high-sulphur fuel oil pushes demand toward the centre. So how secure is demand growth in the central pillars? Gasoline (and diesel’s) strength is a combination of a several factors: they are relatively stable liquids in normal conditions allowing transportability, and their energy densities are large at 10kWh/litre. But they bring with them the carbon by-products of CO2, and its environmental impact, and a thermodynamic limit of about 30% efficiency when burnt. This makes gasoline and diesel, for all their dominance, sitting targets for regulation and alternative technologies. A close look at their demand profiles in the three largest consumer regions highlights their challenges for future growth – Chart 3. These three regions account for 55-60% of total demand, and a significant proportion of growth. As the chart shows, the US is already long past post-peak in diesel, and China is entering this phase after a strong growth period. Both countries consumption is dominated by the commercial truck sector, and China’s heavy industrial phase is now starting to recede. So the future of global auto diesel demand and its growth lies with the EU auto market – but this sector has suddenly come under severe stress. Oil’s diesel fraction contains small but important levels of nitrogen. Diesel engines burn at high temperatures causing the release of yet another problem gas, nitrogen dioxide, NO2. This is another example of oil’s “externality problem”: the environmental stress it creates by dint of chemical side-effects even from relatively minor components. International fuel standards have been put in place to limit these emissions due to growing evidence of their impact on human health (NO2 is another acidic gas and causes respiratory problems). In 2015 the world’s largest automaker VW admitted that to meet these standards it had gamed regulatory tests – real world emissions from its vehicles were 40 times those measured in the lab. Other firms were caught doing something similar. “Dieselgate” has caused sales of diesel autos to plummet in its largest market, Europe. Since 2015 diesel’s market share of over 50% in the largest EU markets has fallen close to 30%, and continues to collapse as consumers, commercial and private, switch not only to gasoline but electric alternatives. By 2020, perhaps, this will be offset by the demand switch from heavy-sulphur fuel oil. But meantime, in 2018 and 2019 this core element of crude demand is likely to decline rather than grow, especially if pump prices increase for an increasingly out-of-favour fuel. The story of gasoline is different. It has been the dominant road transport fuel almost without competition for 100 years. As Chart 3 shows it is hard to over-emphasise the importance of US demand to this – especially given the US fleet size is about the same as the EU’s and China’s (longer driving distances, thirstier American engines). But the US gasoline growth rate has been essentially flat over the past 10 years, albeit with a renaissance in the past 3 years due to low oil price. In the EU demand has declined due to the growth of diesel – although this may switch somewhat as diesel’s woes deepen. So what has driven gasoline growth has been China, accounting for about 45% of the total. The element lithium seems an unlikely nemesis for dominant gasoline. It is the lightest metal on earth, even lighter than carbon, but highly unstable, reacting instantaneously in air without the need for heat. Yet this low density and reactivity causes lithium to have the highest energy per weight of all metals, and very high conductivity. The metal cannot be used directly for commercial battery power (yet), but it’s charged atoms , “ions”, can be embedded as lithium salts into the oxides of heavier metals such as nickel, manganese, cobalt (NMC) to create a battery equivalent of the pure metal. Commercially developed in 1991 by Sony, followed by constant improvement over the years, this has created battery energy to the point where they can may aim to generate 0.5kWh/litre and be used to power EVs with around 90% efficiency. This energy density is still 20 times less than gasoline, but with gasoline’s low efficiency this difference drops to 6 times, and with further improvements in lithium-ion development, this could be just a three-fold difference by 2020. That is why with effective battery-pack design, the power, speed and range of EVs are more or less on a par with internal combustion engines today. The battle for car transport is now a battle between two chemistries: brute thermolysis of octane versus the precise electro-chemistry of lithium. The emergence of this viable alternative has allowed a number of national and regional governments to declare a phase out of fossil-fuel engines over the next 10-20 years. One of the most prominent of these is China: a large oil importer and gasoline user, China now has the ability to generate transport fuels locally via lithium-ions. This could act as a major curb on gasoline’s future growth. For all its absolute dominance, gasoline demand growth has averaged around 400-500,000bbls/d pa over the past 10 years. As EVs grow in market share, especially in critical consumer markets, they will subtract from this narrow wedge. Looking at the relative demand growth of diesel and gasoline, the importance of gasoline is clear from Chart 4. The two components of crude growth have worked in symbiosis over the past decade, averaging about 700kb/d growth pa in total, diesel driving this as China’s industrialization developed quickly to 2012, gasoline taking up the strain since 2013. As the EU discards diesel for passenger car transport, this indicates that future crude growth will depend strongly on private road vehicle consumption, most likely outside the US. If EVs grow quickly into this sector, overall crude growth will move into reverse. It’s difficult to be precise when this forces gasoline growth into actual decline, as historic fleet growth, fuel economies and price effects are also important. But at current rates of market capture, EV penetration into the global fleet could remove any increase in incremental gasoline demand by 2021-23. 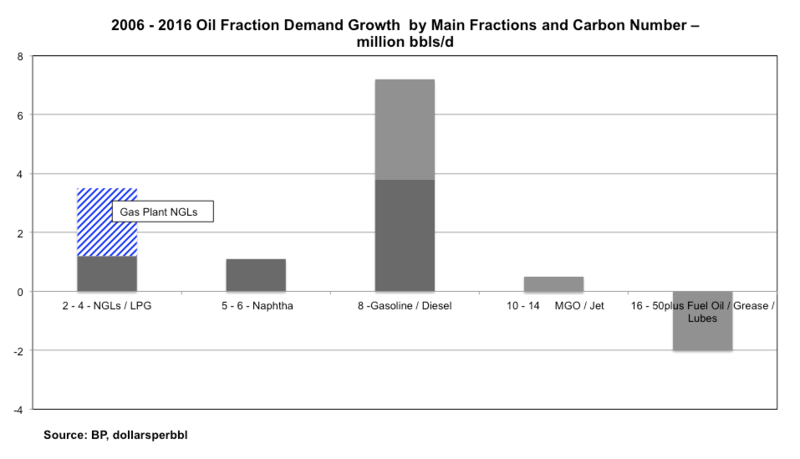 By then it’s hard to see what other crude oil carbon chemistry provides real growth. Oil demand is driven by road transport demand, and in particular, private car gasoline demand, the last high-growth sector of the barrel. The light and heavy fractions demand of petrochemicals, marine, and jet fuels cannot make up the difference – for every increment of decline in gasoline / diesel, a three-fourfold increase has to be found elsewhere. That is due to the competition from natural gas for petrochemical feedstock and the increasingly negative outlook for the heavier fractions from regulations. Oil’s fundamental chemistry means that its dominant transport fuel fractions are having to deal with increasingly powerful regulatory and technological headwinds. International standards and health concerns are sharply removing auto diesel demand from the barrel. Technology in the form of EVs and hybrids is rapidly removing incremental demand growth from auto-gasoline too. Despite all this, major producers such as OPEC are growing more hawkish on supply constraints, and more confident in the belief that constant price increases can be absorbed by consumers, disregarding the impact on near-term and longer-term demand. They seem to believe carbon consumers have limited incentives or alternatives. Crude oil demand is now walking a tightrope.